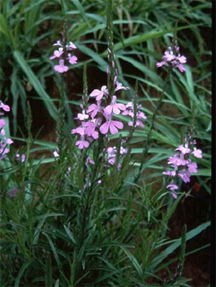 A species of Witchweed, striga hermonthica, a parasitic plant. Its favored hosts include some agricultural crops such as corn, millet, sorghum, sugarcane, rice and legumes. Its parasitic action reduces yields to such an extent that it can wipe out an entire crop. The effects on its host plants include stunting, wilting, and a condition called chlorosis, which is a severe reduction of chlorophyll in the leaves of the host plant. Witchweed operates by sending its own roots into the roots of the host, deflecting host resources to its own use. It is difficult to eradicate, because each plant produces up to 500,000 very tiny seeds, which can endure in the ground for up to 10 years, and which are easily spread by wind, water and animals. The most common means of spread is adherence to agricultural equipment. We can view pet projects as organizational analogs of Witchweed or other plant parasites. Like Witchweed, pet projects deflect to their own use the resources of their host organizations. They spread through the organization when the nurturers of the pets move from place to place, or when others see success come to those who nurture pet projects. Photo courtesy the U.S. Department of Agriculture Agricultural Research Service. It's easy to understand how resources become available to projects that are pet projects of people who answer to no one. But most pet projects are nurtured by people who do have supervisors — if not a supervising manager, then at least a Board of Directors. How do these people secure resources for their pets? How can we detect this activity when people we supervise keep pets? Most nurturers secure resources in one or more of seven basic ways. Here are three methods involving abuse of authority. For methods involving cleverness, see "How Pet Projects Get Resources: Cleverness," Point Lookout for February 9, 2011. It seems almost suicidal, but some nurturers simply violate organizational policy or the expectations of superiors. One wonders how they get away with it, but sometimes they do, at least for a time. Detecting this tactic requires monitoring resource use, but we sometimes forget that monitoring anything at all takes resources. If you establish a policy about resource use, ensure that there are enough resources to monitor compliance. Nurturers sometimes use coercion to extract resources for their pets. For instance, they might exact retribution when a subordinate objects to the allocation of resources to the pet. Others observing the price paid by the objector then learn not to object. More insidiously, nurturers might coerce silence or cooperation from those responsible for monitoring compliance with organizational policy. This tactic becomes clear when it's repeated often enough for the observing supervisor to notice a pattern. It is therefore most effective in environments with significant turnover in supervisory positions, because no one is in place long enough to notice a pattern. The tactic is also effective in environments in which contractors comprise a significant fraction of subordinates, or when most work is carried out virtually, because contractors or people at remote sites are generally less aware of the goings-on. turnover in supervisory positionsuse their legitimate authority to supply resources to their pets, claiming that the action is in the interest of the organization. Even if that is so, the decision might still be an abuse of power if the nurturer knows that another choice would likely have been even more helpful to the organization. Detecting this tactic requires a level of understanding of the nurturer's responsibilities sufficient to support independent evaluation of the nurturer's decisions. In relatively flat organizations, the supervisor of the nurturer might lack the knowledge required for such judgments, or lack time to make them even if he or she has the requisite knowledge. This tactic is therefore of greatest use in flat organizations, or when the nurturer's supervisor is relatively unfamiliar with the nurturer's area of specialization. Would you like to see your comments posted here? rbrencldTIGILCbboDIemner@ChacaXTXwVPkfSztfvRAoCanyon.comSend me your comments by email, or by Web form. I offer email and telephone coaching at both corporate and individual rates. Contact Rick for details at rbrenCrVkVIxYWcPZUZTyner@ChaccXexsoAthQowZttioCanyon.com or (650) 787-6475, or toll-free in the continental US at (866) 378-5470.